Religion • Social-media blitz calls for keeping kin together. Mormons teach, preach and sing about families being together forever in heaven, but some members of the Utah-based faith want to exclude one group from that promise, at least on Earth. And, while the LDS Church supports immigration reform that keeps families together, its leaders have not pushed that idea in worship settings where Mormons are gathered. Nor has it called out those who disagree. In other words, The Church of Jesus Christ of Latter-day Saints has gone largely silent on the issue. That is the view of some believers, who have launched a social-media blitz to revive the discussion. 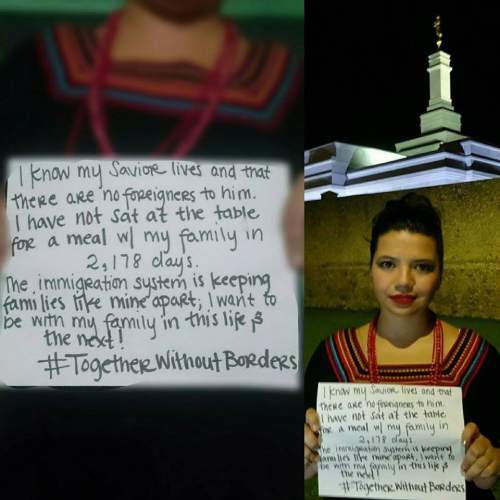 Inspired by the #BlackLivesMatter movement, the assignment is relatively simple: Participants are asked to jot down their Mormon identity and views on a whiteboard with #TogetherWithoutBorders and take a selfie holding the board. They then post the photo on Facebook and Twitter. Dozens already have done so, especially after the Spanish-language TV station Univision highlighted the effort. Several such social-media campaigns "have taken off and have had the power to change a culture," says Tino Diaz, a Mormon who works and lives with his wife and two kids in Provo. "We want to show how LDS culture or religion can support keeping families together." How can Mormons worship at an LDS chapel, hear their faith&apos;s messages of love "and still talk about undocumented members as if they don&apos;t exist or their families should be separated?" Diaz asks. "If you care about keeping and preserving families, why not stop this?" He and other organizers are aware that their church already endorses revising immigration laws to coincide with bedrock beliefs about the importance of family and justice. The 15 million-member faith has endorsed, but not signed, the Utah Compact, a guiding document widely embraced by religious, business and civic leaders in calling for a federal solution with an eye toward compassion for undocumented immigrants. "Families are meant to be together. Forced separation of working parents from their children weakens families and damages society," the LDS Church website says. "Public officials should create and administer laws that reflect the best of our aspirations as a just and caring society. Such laws will properly balance love for neighbors, family cohesion, and the observance of just and enforceable laws." 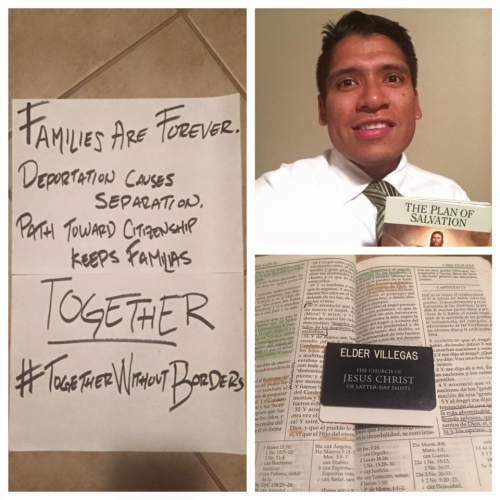 Cristobal Mauricio Villegas, another of the #TogetherWithoutBorders organizers, was among the first to post his message with the hashtag. "Families are forever. Deportation causes separation. Path towards citizenship keeps families together," his board reads, next to photo of the Latino dressed in a white shirt and tie, with his Mormon missionary tag atop a page of LDS scripture. Deporting undocumented immigrants "is a taboo topic at church," says Villegas, a Utah Valley University student who attends a Young Single Adult Mormon congregation. "Why are we not discussing the impact of not keeping families together? This doesn&apos;t follow what we are taught. Maybe it&apos;s because we look different, but we are still strong families. We need to start raising our voices." It could be that "some people are scared," surmises Laura Lopez, who also posted her photo and message. "It&apos;s a touchy topic." The Utah County mother and Brigham Young University student says the group hopes to let supporters know they are not alone. "I am undocumented," Lopez says, explaining that she came with her LDS parents when she was a child. "If a community stays quiet, everyone else will step on us." Azul Uribe posted her message and backs the effort. But it&apos;s too late for her  the U.S.-reared Mormon was deported from Utah to Mexico six years ago this week. Uribe grew up in several states, including Texas, unaware that her parents arrived without documents. Her family, she believes, thought if she assimilated well, was a good LDS kid, and married early to an American, her legal status never would be discovered. At age 21, though, when she was attending college in Cedar City and house-sitting for a family, Uribe got into an altercation with an unruly teen and ended up in jail and then a detention center briefly, where officials grilled her about her birth, documents and status. "When I went in, I was living the good girl Mormon life, waiting for a missionary who was the only guy I had ever kissed and suddenly I was forced to strip naked [to be searched]," Uribe recalls. "There&apos;s no coming back from this." She believes, based on their conversations, that those in the detention center who treated her with contempt and hostility were Mormons. "These people go to church and say &apos;love your family&apos; and &apos;love your neighbor,&apos; " she says, "  until it&apos;s someone they don&apos;t approve of." Some members of her Cedar City LDS congregation wrote letters backing her but to no avail. Uribe was deported to a place she had never lived, while her family remained in Dallas. She was banned from even visiting for a decade  a prohibition that will last for another four years. "I&apos;m hearing all these things about families being important, but I have to Skype to see my 8-year-old niece&apos;s baptism," she says. "I feel like my family isn&apos;t important [to other Latter-day Saints]." All of this makes #TogetherWithoutBorders even more urgent for its organizers. In the next phase, they hope to take their cause to festivals in Provo and other places. They also plan to film the participants and post their messages on YouTube. The reformers eventually aim to circulate a petition on immigration reform among Mormons. Uribe says her fellow believers should embrace this message. "Our history, as a church, is a history of migration, people moving from one place to another," she says from her home in Mexico. "It&apos;s amazing how detached Mormon culture is about immigration. For us to treat it like a historic relic that is no longer relevant is mind-boggling." Uribe always wanted to blend her faith and her activism. Now she can  and is.